For my final entry documenting the characters of Girl Connected, I will conclude with my experience in India with our protagonist Ayesha. Out of the five girls in five countries we filmed, it was Ayesha we found first. For a long time, her story was the model in our efforts to find the protagonists in the other countries. Naturally, I was eager to film Ayesha’s story immediately. But the process of obtaining the right visas and permits was painstakingly difficult, and my plan to film immediately was becoming harder to carry out. The irony of our roller coaster visa application process is that Ayesha and the Indian authorities share a common interest: the protection of young women. I only learned later that the reason our permits took so long was because documentary shoots about teenage girls require additional steps of approval from the administration in Delhi as protective measures. Ayesha’s life is also all about protection of girls and young women. She focuses on how they can protect themselves through self-defense, and more importantly, self esteem. 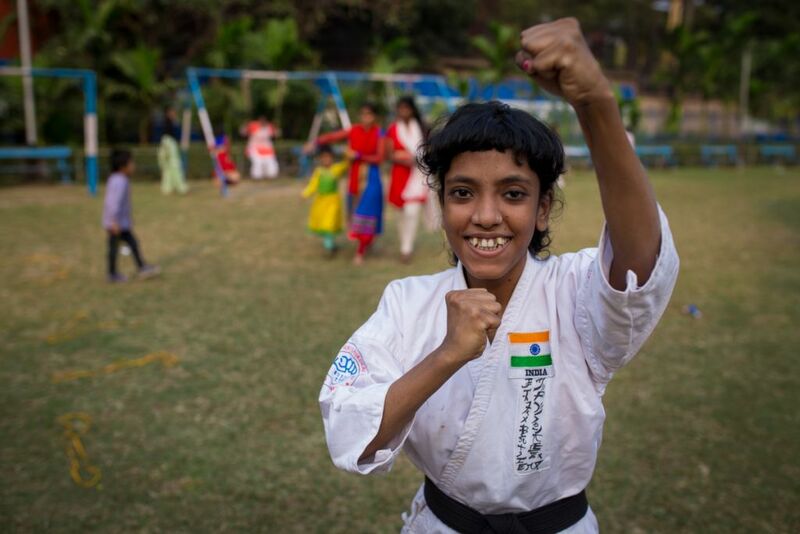 Girls as young as six years old come to her weekly class in a Kolkata park, where she offers free training. It’s truly impressive. Some of the older girls have become quite confident and during breaks from training can be found practicing complicated karate moves on each other just for fun. Ayesha has a black belt in karate and is an international champion. It sounds like a dream, but her life is fraught with challenges. She lives with her family in extreme poverty in a Kolkata slum. On some days, her only meal is a single chapatti and a glass of water. She was diagnosed with epilepsy at the age of five, which she manages with medication that makes her drowsy. Partly due to her condition, it’s clear her general speech and body coordination have suffered from the occasional seizure she has had. When she enters the park for her training sessions, everything changes. She is fueled with strength. Her speech becomes louder and clearer, and her body is strong and determined. She demands respect from the 30-40 girls present, as they listen to her in awe. They attentively follow her instructions, fully dressed in veils or hijabs under the strong Indian afternoon sun. This is where Ayesha is at her best, fulfilling her dream to become a teacher to other girls. Yet besides the fragile Ayesha and the lioness Ayesha, there is a third one. When the training is over, she runs to the back of the field along with the other girls, and eagerly jumps on the swing while one of her students begins to push her. Others jump on the climbing frame, laughing and taking turns. It is here that we realize that, despite the fancy karate moves and the serious fight they are up against, these are still little girls at heart.